Experience an entirely new story, cast of characters, and suite of game mechanics in the indirect sequel to Rainbow Moon. Hey everyone, this is Marcus from SideQuest Studios. We are excited to announce that Rainbow Skies, a game that has been in development for over five years, will launch exclusively on PS4, PS3 and PS Vita on June 26 in North America. For those that haven’t heard of it before, Rainbow Skies is an RPG with turn-based battles, exploration, character development, monster breeding, storytelling and a whole lot more. 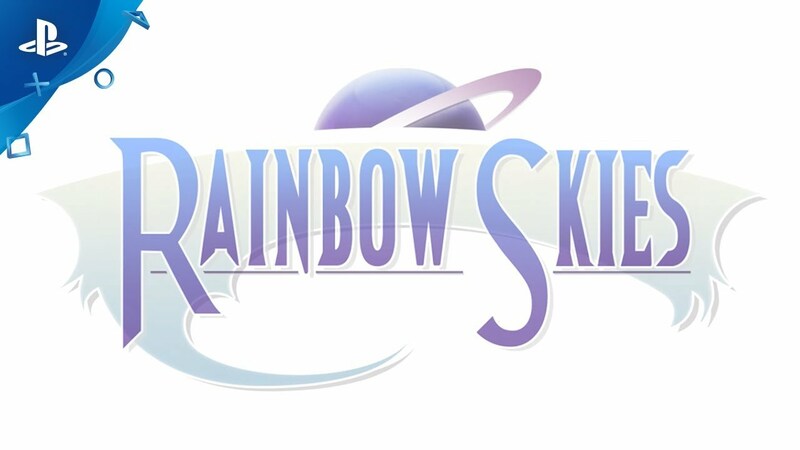 Rainbow Skies is an indirect sequel to Rainbow Moon, which launched originally back in 2012 for PlayStation 3 and then later for PlayStation Vita and PlayStation 4 and received an awesome reaction from the PlayStation audience. 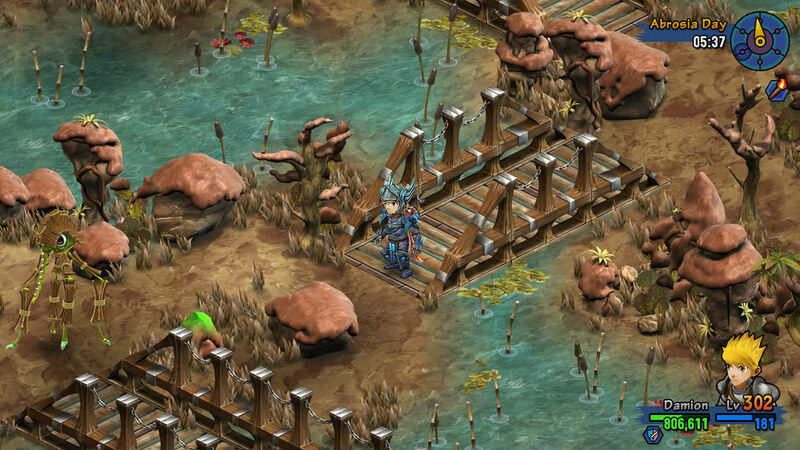 Rainbow Skies includes an entirely new story, cast of characters and game mechanics for you to discover. At SideQuest Studios and publisher eastasiasoft, we have put all our creative energy into Rainbow Skies, which we believe both fans of the series and newcomers will appreciate and love. From the outset, we set ourselves high targets and goals so that we could to deliver the best indie RPG experience possible. We have implemented some exciting new features which were not part of our original concept, such as a deep in-game awards system that tracks trophy and general awards progress. We have been making PlayStation games for more than a decade at SideQuest Studios. While we are proud of all of our games, the team has poured blood, sweat and tears into Rainbow Skies and this is reflected in the level of details and features that exist within the game. I have tested Rainbow Skies for more than 1,000 hours and still enjoy every moment of it. What makes Rainbow Skies truly unique is the mix of turn-based mechanics combined with an enormous world to explore. The battle system in Rainbow Skies places the player in complete control, where you will have time to think about the exact moves you need for victory. Defeating enemies will need a skillfully tactical approach where you carefully select your actions from among hundreds of available skills, items and options. With striking versatility and numerous gameplay options, Rainbow Skies suits any type of playstyle. If you just want to enjoy the story, you can complete the game in about 30-40 hours. On the other hand, if you like to leave no stone unturned, you can look forward to side quests and optional content that will keep you busy for hundreds of hours. If that’s not enough, we have added some awesome end-game content, ultimate weapons and gear and tons of optional bosses and enemies. Still want more? How about treasure hunting, fishing, lottery and monster breeding? 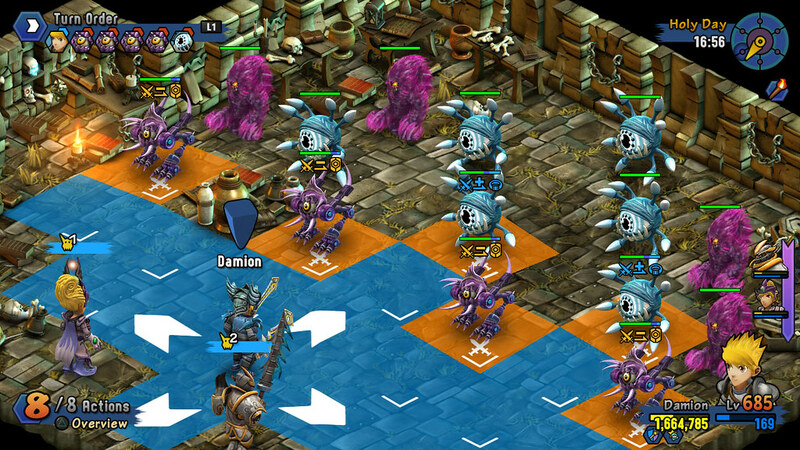 You will be surprised by how much content and secrets there are to discover in Rainbow Skies. I’d like to take the opportunity to thank all our fans for their patience and loyalty. Many of you are probably wondering what has taken us so long to release the game. Rainbow Skies has been developed by a core team of just five people. To make Rainbow Skies accessible to as many players as possible, we have localized the game into five different languages (English, French, Spanish, German and Italian). Furthermore, we wanted to ensure that Rainbow Skies was balanced for a large variety of players. 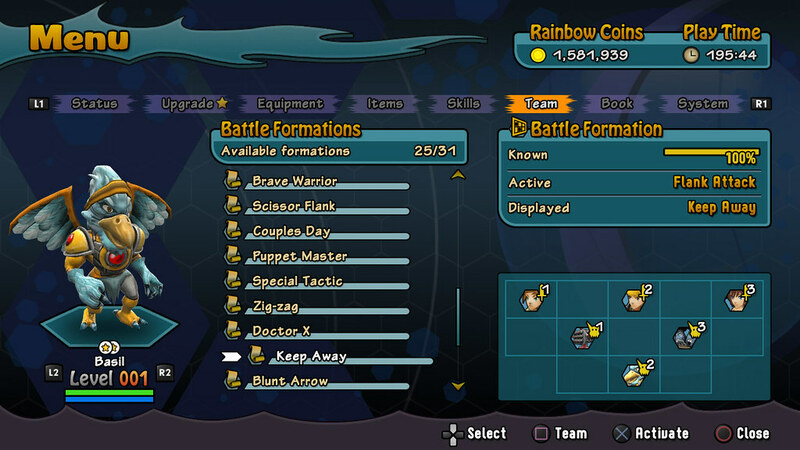 Rainbow Skies features a complex battle rank system, which allows players to scale the difficulty according to their preferences. This led to an unforeseeable amount of testing hours, where we devoted as much time and effort as necessary to ensure everything worked the way we envisioned. Finally, Rainbow Skies runs on an in-house developed engine and will be available simultaneously for PS4, PS3 and PS Vita. Making no technical compromises, Rainbow Skies runs at a constant 60 FPS with relatively short load times on all platforms, including PS Vita. By taking advantage of Cross-Save, you can play Rainbow Skies wherever, whenever and however you want. We can’t wait until launch and hope that you will have as much fun playing Rainbow Skies as we did creating it. If you have any questions or feedback, please let me know in the comments below. See you all soon on Lunah! Awesome! Looking forward to it! I got the Platinum in Rainbow Moon, will Rainbow Skies have a platinum as well? Yes, there are over 40 trophies, including a platinum. Great timing! That’s just the days after my birthday! Been looking forward to this for ages. Here’s hoping that the physical releases on sake at PlayAsia release soon afterwards. I’ve had it preordered for quite some time. It’s expected to ship very close to the digital release. And there was a serious level of rejoicing. Got my SE preordered. any chance it’ll be cross-buy? either way, excited! Yes, it’s 3-way Cross-Buy. Buy it on just one system and play in on PS4/PS3 and PS Vita. Cross-Save is also supported on all 3 platforms of course. I’ve been waiting for this game for half of my adult life! Wikipedia calls Rainbow Moon a tactical RPG. Is Rainbow Skies also a tactical RPG? Thanks. Yes, it has the same roots, although tweaked in almost every aspect. Cross-buy, cross-save and PS exclusive? I will show my appreciation by buying this at launch. Thank you. So does everyone else who posts about games on the Vita. Every support by spreading the word of mouth or recommending this to friends is much appreciated, thanks. I have a question, this game have any way to play with my friend on co-op or something like that? Sorry, this is a single player game. What you can do is upload your save-data to the game-server from a certain point, so you can compare your results with friends and players all over the world. This looks great!!! Will be buying for sure. Definitely excited about this release. I saw the trailer awhile back and wondered if this was ever going to actually come out. Big fan of rainbow moon. Curious if you all have any interest to release on other platforms as well? Particularly PC and switch? Or are you locked in contract with sony? Because we’re using our own custom engine, a port is not easy and always requires some time. We never say never, but currently there are no concrete plans. Wahoo!!! Boy it’s felt like a looooong time, but it’s totally going to be worth the wait. My Vita is SO ready! Rainbow Skies looks amazing! Neat work on the game, even though it took so long. Hope it’ll keep them busy for a while. I hope there are plans about Soldner X-3 on the PS4 soon, since I really enjoyed Solder X-2 & The Last Chapter DLC. I’ve been waiting to see it. I know X-2 have sub-bosses, that I didn’t know before, but I would really like to see at least one sub-boss in each stage, complete with their own health bars & battle themes, & more stages in X-3. Think you may make time to have art books about Solder X-1 & Solder X-2? Would really like to see the artwork about these games, including the bosses & their names in English. People buy the games’ art books, you know. Also, I can’t remember all the bosses’ names in X-1 nor X-2. Who can make a name list that can be translated to English? Sure would like to see Soldner X’s adventures continue one day! Woohoo! Vita is Life. Glad to see the support from many devs who like this platform.